Legal & General and Mitsubishi Estate Company (“MEC”) have established a 50:50 joint venture which will fund the development of the consented Central Saint Giles mixed use scheme, with an end value of approximately £450 million. Legal &General has already started the development of Central Saint Giles, the focal point of the much-needed regeneration of the St Giles area in London. Central Saint Giles has been designed to the highest architectural and urban design quality by the world class architect Renzo Piano and will be completed in 2009. The project comprises 400,000 sq ft of offices, 40,000 sq ft of affordable housing block and 40,000 sq ft of private housing block. The three elements form a new public piazza at the heart of the project surrounded by 30,000 sq ft of retail and restaurants creating a true integrated mixed use scheme. The project also improves the public realm creating a second public space at Princes Circus with significant improvements to St Giles High Street. Pedestrian routes through the scheme are created improving permeability linking into other adjoining sites. Legal &General supports the regeneration of St Giles and sponsored the St Giles Renaissance Forum to act as a catalyst for the development of adjoining sites. Legal &General are fully aware of the Mayor of London’s ambitions for the St Giles area and have held meetings with his advisers. Legal &General will work with adjoining landholders on their plans and strongly believes that the implementation of its consent will provide an early catalyst for regenerating St Giles. 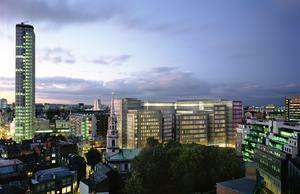 Central Saint Giles was granted planning permission in July 2006 in accordance with an adopted planning policy framework comprising the Mayor’s London Plan, the Camden UDP and Camden’s Area Framework. It is also sympathetic to opportunities for the development of adjoining sites. Mark Creedy, Legal &General’s Managing Director, Property, said, “Legal & General is delighted to be working with MEC on the development of Central Saint Giles, which will begin the area’s regeneration to provide a vibrant new St Giles Quarter at the eastern end of Oxford Street. The project will deliver the Mayor’s key objectives of jobs, homes and world class architecture, including new public realm and permeability between Oxford Street and Covent Garden. Legal & General were advised by Jones Lang LaSalle and Cushman & Wakefield advised MEC.